For the benefit of our customers we make these documents available. Your continued support will enable Company Seven to continue to expand this section over time. DayStar Bandpass Filters: An Introduction To What They Show And Why a color illustrated article by DayStar and Company Seven to help our clients better comprehend what the terms such as bandpass mean, and to better understand those major features of the Sun that can be observed and photographed through a DayStar filtered telescope. The Sun's observable features include: the Chromosphere, Prominences, Spicules, Field Transition Arches (FTA's), Plages, Filaments, Ellerman Bomb (a feature of Emerging Flux Regions), Solar Flares, and Emerging Flux Regions. 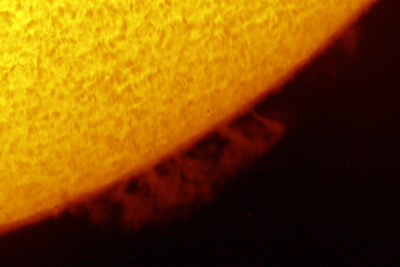 Right: An amazing Hedgerow Prominence on the Sun as imaged on 21 Oct 2010 though a DayStar 0.4 Angstrom QUANTUM PE filter. Filter attached to a 110mm refractor telescope with 4x Powermate Lens at f/32. Image courtesy of DayStar (95,430 bytes). DayStar Bandpass Filters: An Introduction To Prominences And Their Classification a color illustrated article by DayStar and Company Seven explaining what one sees of the prominences. The forms prominences can take vary widely, but the general scheme described by Zirin is somewhat useful in categorizing them and so it is included. 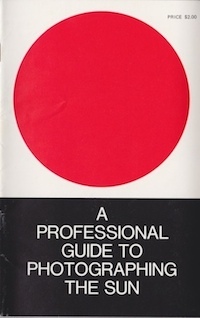 A Professional Guide To Photographing The Sun by Donald G. Carson. The DayStar Hydrogen-Alpha filter systems were based on developments of filter arrangement and bandwidth tuning that were initially pioneered at Carson Astronomical Instruments, Inc. Del Woods learned much about his craft while employed at Carson, and after that company closed in 1975 Del went on to found DayStar Filter Company. This is the complete photo-illustrated thirty-six (36) page booklet scanned and prepared by Company Seven as an Adobe .pdf file (13,394,526 bytes bytes) at 108dpi. The content of this booklet includes an introduction to the Sun, white light solar photography, solar observations, hydrogen-alpha solar photography (including selecting and attaching the solar filtering gear), photographic techniques, observing other wavelengths, and solar eclipse photography. While somewhat dated owing to its focus on film photography, this is an insightful compilation of information that remains pertinent even today. Contents Copyright 1973 Carson Astronomical Instruments, all rights reserved, used by permission. The Download Link is provided solely to our customers for their own use, only by E-Mail request. A Solar Telescope - for Lovers of the Sun by Michael Olshausen. The Questar Solar Observatory system was developed by a local customer of Company Seven with the cooperation of DayStar Filter Company, Questar Corporation, and of Company Seven. The system mates a compact Questar Standard telescope with a DayStar Hydrogen-Alpha filter to provide and extremely portable Solar Observatory. This is the article prepared by Mr. Olshausen for publication in the Company Seven "C-VII Journal" describing the development and operation of the system. "The DayStar Filter - Hydrogen Alpha UNIVERSITY and ATM (Oven Models). A complete illustrated instruction manual in Adobe ".pdf" format, as is produced by Company Seven for customers who buy the DayStar Hydrogen Alpha filter from us. Some details may vary from filter to filter, and so this publication should not be considered as providing those settings that may be entirely appropriate to your particular DayStar filter. This manual outlines solar observing, describes and illustrates the components of a DayStar Hydrogen Alpha filter system. We also provide some application notes facilitating set up and operation of the filter, how to predict fields of view, how to use these systems visually and for imaging. This publication is not applicable to the DayStar Calcium K-Line filter series however, Company Seven does provide an entirely different manual for our customers who choose to buy that filter series. Copyright 2003, all rights reserved. Download size is 2,048,625 bytes. DayStar QUARK Addendum By Company Seven. This is the complete twelve (12) page color illustrated document Company Seven provided by solely to those who have acquired this equipment from us. This expands upon the instructions provided by the factory and explains the components provided with the QUARK filter systems, set up, power requirements and sources, operation, components specifications, care and maintenance, and guarantee. Document provided as an Adobe .pdf file (4,453,312 bytes). Publication content copyright 2014 by Company Seven. Download Link provided to our customers only by E-Mail request. DayStar Hydrogen Alpha Filters Buyers Guide. This four page color illustrated document briefly explains the features that are visible through the DayStar filters, it describes the available ION and QUANTUM series Hydrogen Alpha filters, their pre filters filters, and a brief review of how to configure a DayStar Hydrogen Alpha filter and pre filter for use on your telescope. Prices of these filters (current as of January 2014) are included. The document provided as a high resolution Adobe .pdf file (412,053 bytes bytes). DayStar Filters & Accessories Catalog. This is the complete sixteen (16) page color illustrated high resolution document. This includes educational articles explaining the features that are visible through the DayStar filters, the SolaRedi 80 solar telescopes, the SR-127 Hydrogen Alpha telescopes, Dual Bandpass Doppler telescope, the ION, QUANTUM SE and QUANTUM PE and T-Scanner series Hydrogen Alpha filters and their pre filters, Hydrogen Beta filters, Calcium II H line filter, Calcium II K line filter, Sodium D line filters, Helium D3 line filters, custom wavelengths filters, the Solar System Filter Wheel (housing up to 4 separate filters in one housing). The document provided as a high resolution Adobe .pdf file (97,587,418 bytes). The Download Link is provided solely to our customers for their own use, only by E-Mail request. DayStar QUANTUM Series Filters: White Paper. This is a comprehensive forty eight (48) page color illustrated document explaining the QUANTUM series precision optical bandpass filters for solar research and observation. The primary coverage is of the Hydrogen Alpha models. This includes explanations of spectral lines, and overview of the QUANTUM filters and how they work, applications including choices of telescopes and how to configure them, operational notes applicable to visual/film/DSLR/CCD imaging. The document provided as a Adobe .pdf file (2,742,432 bytes bytes). DayStar QUANTUM Series Filters Housing Drawing . Mechanical drawing showing exterior dimensions of the Filters Housing of the QUANTUM SE and QUANTUM PE series filters. This shows the integral LCD display panel and control buttons, and the hole patterns necessary to know if you intend to custom fabricate adaptive hardware. The document provided as an Adobe .pdf file (39,783 bytes). Content copyright 2009 DayStar Filters, LLC. DayStar Q3GFTF - QUANTUM Series Filters Front Flat T-Thread Plate Drawing. Mechanical drawing of the Q3GFTF - Quantum Front Flat T Plate as offered for the QUANTUM SE and QUANTUM PE series filters. This is the front most plate, that will be attached near the gold element side of the filter. The document provided as an Adobe .pdf file (33,158 bytes). DayStar Q3GFTF - QUANTUM & ATM Series Filters Combo Plate Drawing . Mechanical drawing of the Q3GFTF - Quantum Combo Plate as offered for the QUANTUM SE, QUANTUM PE, and ATM series filters. This is rear most adapter plate of the filter body, nearest the red element side of the filter. This incorporates both male and female adapter. The Male thread is 2x24" SCT thread, the Female is T-thread. The document provided as an Adobe .pdf file (39,783 bytes). DayStar QUARK Hydrogen Alpha Filters Brochure. This two page color illustrated document briefly explains the filter arrangement, and a brief review of how to configure a DayStar QUARK Hydrogen Alpha filter for use on the intended telescopes. Prices of these filters (current as of April 2014) are included. The document provided as an Adobe .pdf file (2,032,964 bytes bytes). "DayStar Quantum Control and QuantumCommand Software, v1.0" is a Windows® PC based application, also useable on an Apple Macintosh running a Windows® OS. This allows one to communicate from a Serial Port, or USB Port with Serial Converter, to a DayStar Quantum series filter. Quantum Control is intended as an educational tool, as a way to control up to four Quantum filters remotely, and to provide more control than is possible with the filter's limited hardware user interface. The software provided graphical feedback of the filter status displaying in Ångstroms or Nanometers, and allows the operator to control the filter, maintain a bandpass log, and more. Right: DayStar Quantum Control software indicating Quantum SE 0.5Å Hydrogen Alpha filter coming up to temperature (55,879 bytes). For more advanced users this download includes QuantumCommand, a standalone, command line application intended for scripted control applications. QuantumCommand takes command line input, performs the requested action, and displays the results. Users can utilize this software in concert with third-party automation packages to accomplish timed, scripted, or complex control sequences. QuantumCommand.exe can be found in the directory in which you installed the Quantum Control software, typically C:\Program Files\DayStar Filters\QuantumControl\QuantumCommand.exe The executable can be copied to any other location, it does not need any support files. Provided as an .msi file for the Microsoft Windows operating systems. This file contains the application and instructs the Windows® installer application about which files to install and where to install them. A help menu is incorporated within the application, we encourage you to start by reading the 'Getting Started section or customers of ours can contact Company Seven for assistance. Download is 271,360 bytes, content copyright 2008 DayStar Filters, LLC. "DayStar Quantum Control and QuantumCommand Software, v1.2" is a Windows® PC based application, also useable on an Apple Macintosh running a Windows® OS. This allows one to communicate from a Serial Port, or USB Port with Serial Converter, to a DayStar Quantum series filter. Quantum Control is intended as an educational tool, as a way to control up to four Quantum filters remotely, and to provide more control than is possible with the filter's limited hardware user interface. The software provided graphical feedback of the filter status displaying in Ångstroms or Nanometers, and allows the operator to control the filter, maintain a bandpass log, and more. Available for customers of Company Seven by request. Download is 1,102,336 bytes, content copyright 2010 DayStar Filters, LLC. "How to Become An Expert Solar Imager". is a comprehensive tutorial about how to image the Sun, and process the images captured to attain results like the professionals do. The materials within the DVD How to Become An Expert Solar Imager will teach you how to not only capture images of the Sun but it also provides instruction about how to process images, just like the professionals do, to colorize monochromatic images, to achieve a dramatic result, or clarify subtle details. So with the proper equipment and this instruction you too can experience the Sun and produce amazing results: the Sun can be your object of study or of art. Content is available for sale by Company Seven as video and software files delivered in a DVD. Publication content copyright Ninian Boyle and Pete Lawrence.